Printed in HaModia (USA), Wednesday, May 8. Reprinted with permission of HaModia. We don’t know each other, and I believe there is little chance that we will ever meet. 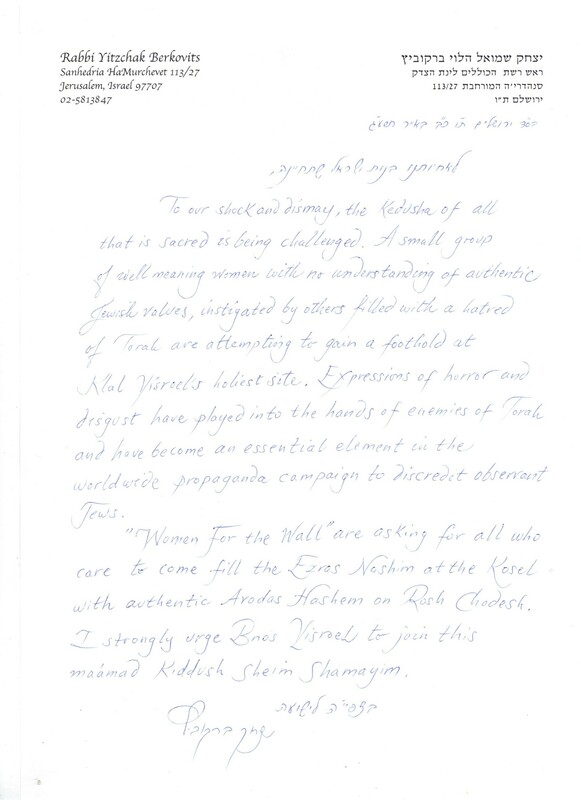 After weeks of hearing and reading about what you and your friends, Neshot Hakotel (Women of the Kotel), are trying to accomplish, I feel compelled to be the voice of hundreds of thousands of women around the world with views completely contrary to yours. For over 2,000 years, we Jews have yearned for Zion daily and continue to pray for its redemption. Rabi Yehuda HaLevi wrote over a thousand years ago, “Leebee baMizrach v’anochi b’sof Ma’arav.” He left Spain, and after a long, treacherous, and exhausting journey arrived in Yerushalayim. Following him were the Rambam, Baalei Tosafos, mekubalim, the Shelah Hakadosh, talmidei haGra, talmidei haBaal Shem Tov, and others. What brought them all was their deep love of Zion and Yerushalayim. I apologize if some of the names are unfamiliar to you, but let me make you aware that they are an integral part of Jewish history. And they are an integral part of Jewish life today. No, their life stories will not be found in textbooks in secular schools in Israel, as these textbooks recognize only Zionist aliyos, starting from 1881, which was considered the first aliyah. What was the goal of the first aliyah? To fulfill the ideals of the nationalistic trend that was rampant from one end of Europe to the other; these people chose Zionism. This group was known as BILU, an acronym for Bais Yaakov Lechu Venelcha. 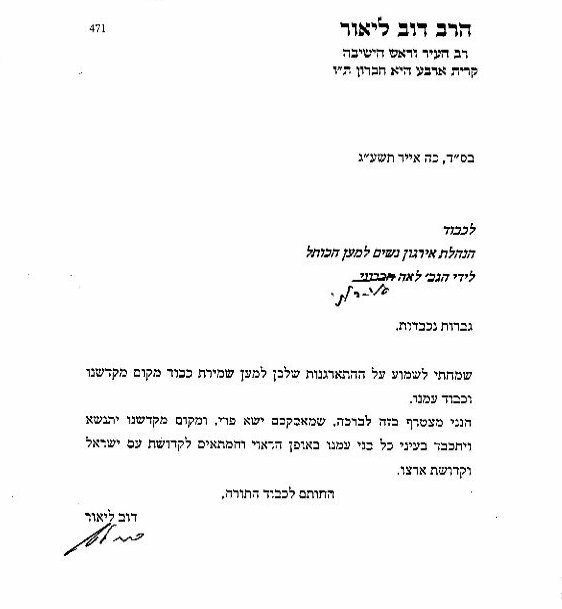 What they conveniently neglected to take into consideration was the end of the passuk — b’ohr Hashem. I came to Jerusalem Passover night. My first direction was towards the Kotel. There I found many of our fellow brothers, inhabitants of Jerusalem, standing and praying loudly. Their meager faces, foreign movements, and strange clothes — all appropriate for the terrible-looking Kotel. And I stand and look at them and the Kotel and one thought filled every space in my heart: these stones witnessed the destruction of our country, and these people [represent] the destruction of our nation. Let’s skip to almost 90 years later. In 1978, when the 29th Zionist Congress recognized the Reform and Conservative factions as legitimate streams of Judaism, Rabbi Moshe Sherer, z”l, the legendary Agudah leader in America, wrote that “the decision was a direct result of their declaration at the 2nd Zionist Congress ‘that religion was a private matter of every individual; that Am Yisrael is like all other nations and Zionism is a replacement for the original Jewish tradition. '” Am Yisrael is not like other nations, emphasized Rabbi Sherer. Many years have passed since then. In the post-Zionism era, Echad Ha’am was long forgotten by people who described themselves as Zionists, but the descendants of the Jews who he dared to describe as the destruction of our nation are alive and well and continue to come every day, every Shabbos, every Rosh Chodesh, every opportunity, to the holy Kosel to beseech the Alm-ghty for compassion for all Jews. You are trying to pass yourself off as a representative of American Jewry. You claim that American Jewry consists mainly of Reform and Conservative Jews. Let me share some facts with you. You know as well as I know the exploding numbers of Orthodox Jewry, even though you refuse to recognize it. You choose to use the Kosel — the ultimate symbol of unity — as your battleground, claiming that it is forcibly being taken away from American Jewry by narrow-minded Orthodox Rabbis and their fanatic followers. Well, let me tell you, nothing was taken away from you, as you never had it in the first place. Your purpose for the Kosel is as a springboard to strengthen Reform Judaism in Israel. It won’t help, Anat. Long after you tire of this campaign and find a new agenda, we will still be there, davening as we have done for generations, waiting for the ultimate Redemption, waiting for all Jews, including you, to come home to the truth. History was, is, and always will be on the side of the truth, Moshe emes v’Toraso emes. Whoever embraces the truth of Torah has a true claim to it. very erudite and to the point! very nice. I hope she read it. (she probably did).